Two Lapland Longspurs with a large group of Horned Larks at Cannery Woods Road, along with a Tree Sparrow at feeders with a mixed group of sparrows were viewed courtesy of Mike and Evelyn Shank and family. A heavily-clouded, snowy day gave way to sunshine toward evening. The larks and longspurs repeatedly flew from fields to the cracked-corn strewn lane to enjoy the feast provided by their gracious hosts. 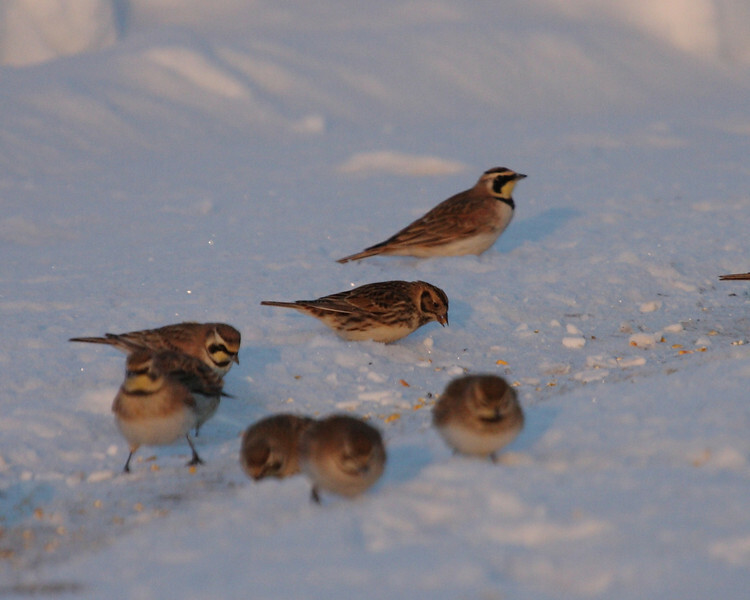 Lapland Longspur centered among a group of Horned Larks. 2-15-10.